Other Notes: Hops – Warrior and Cascade. 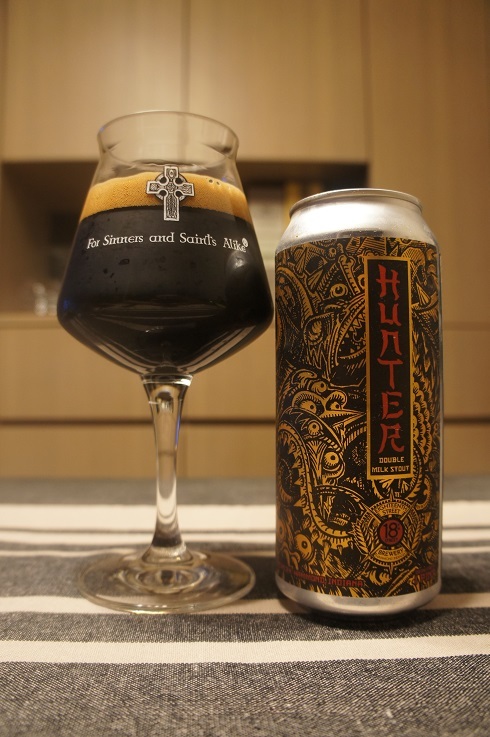 This is the base beer for the Hunter Vertical Series. Brewer Description: (from can) Cocoa nibs and lactose sugar create a rich chocolate flavor and a creamy texture. Vanilla, roast, and caramel sweetness are met with a bright hop bitterness. Intro: A 1 pint can, canned on 20th December 2017. Poured into a Lost Abbey teku glass. Appearance: Black in colour with a one finger creamy brown head that had ok retention but no lacing. Aroma: Roasted malts, chocolate and cocoa with hints of vanilla and nuttiness. Taste: Similar to the aroma with roasted malts, chocolate, cocoa, vanilla and caramel with a light char. Also a nice light sweetness throughout. Overall: Very nice Double Milk Stout with great flavours that wasn’t overly sweet.